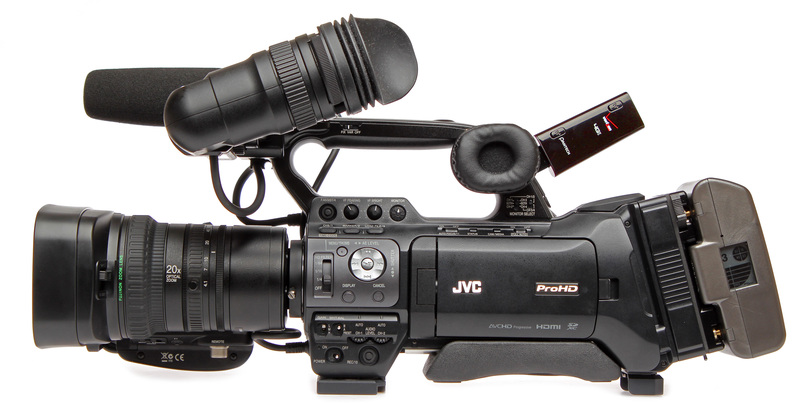 WAYNE, NJ (February 3, 2014) – JVC Professional Products Company, a division of JVC Americas Corp., today introduced its new GY-HM890 and GY-HM850 ProHD shoulder-mount camcorders, which set a new benchmark in ENG camera IP integration. Complemented by a new interchangeable Fujinon 20x autofocus zoom lens, the new cameras deliver outstanding full HD image capture and delivery, while the built-in streaming engine, FTP and 4G LTE connectivity allows live HD transmission directly from the camera without being attached to external costly and cumbersome bonded cellular solutions. The new 800 Series cameras significantly expand on the live HD streaming and file transfer capabilities introduced in the popular GY-HM650 mobile news camera. 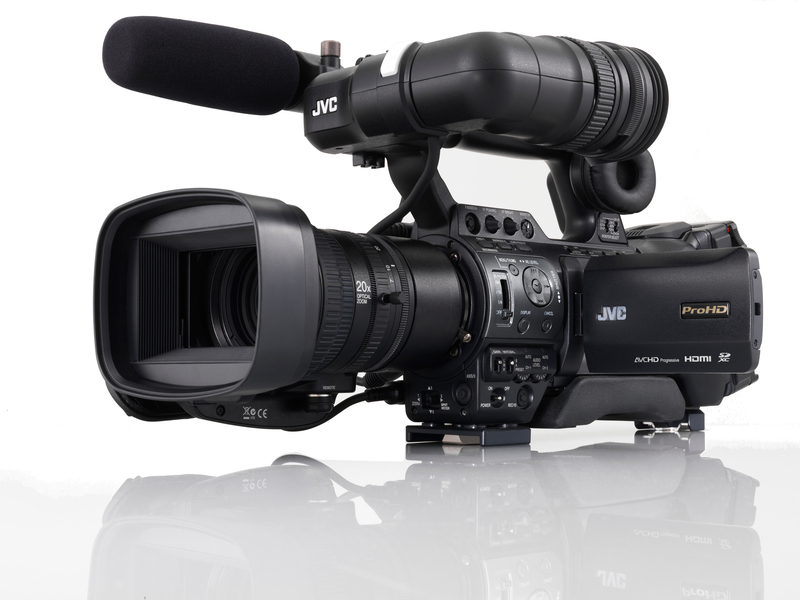 JVC’s exclusive dual codec design allows the new cameras to transmit live HD footage or transfer files in the background while shooters continue to record footage in their normal workflow. When paired with a Verizon 4G LTE modem, which is connected directly to the camera via USB, the camera transmits footage to a broadcast facility in real time. JVC's Advanced Streaming Technology (AST) provides content-aware error correction, bandwidth shaping, and real-time feedback of streaming status. Each camera features a built-in processor with proprietary algorithms that maximize bandwidth to ensure reliable transmission even under difficult conditions. Plus, advanced content aware error correction compensates for up to 30 percent packet loss. Streamconfidence provides stream and LTE status in the high-resolution 4.3-inch LCD monitor and LCOS color viewfinder. The cameras provide secure FTP file transfer on location, as well as live monitoring and extensive camera and lens control via Wi-Fi from a smartphone or tablet (iPhone, iPad, or Android). For broadcasters who use metadata, a built-in GPS allows location information to be recorded. Plus, metadata can be edited on a smartphone or tablet and transferred to the camera via Wi-Fi. The GY-HM850 and GY-HM890 are also compatible with JVC’s Professional Streaming Services, also announced today, which include the new JVC Broadcaster server powered by Zixi for reliable live content delivery to variety of hardware decoders, CDNs, and Web. Both cameras feature three, 1/3-inch 2.07 effective megapixel CMOS sensors that capture full 1920x1080 images. The imagers provide 12-bit readout, F11 sensitivity (60Hz), and excellent signal-to-noise ratio. The new Fujinon wide angle 20x zoom lens features auto focus, built-in optical image stabilization, and chromatic aberration correction. The interchangeable 1/3-inch bayonet lens also includes manual focus, zoom, and iris rings. 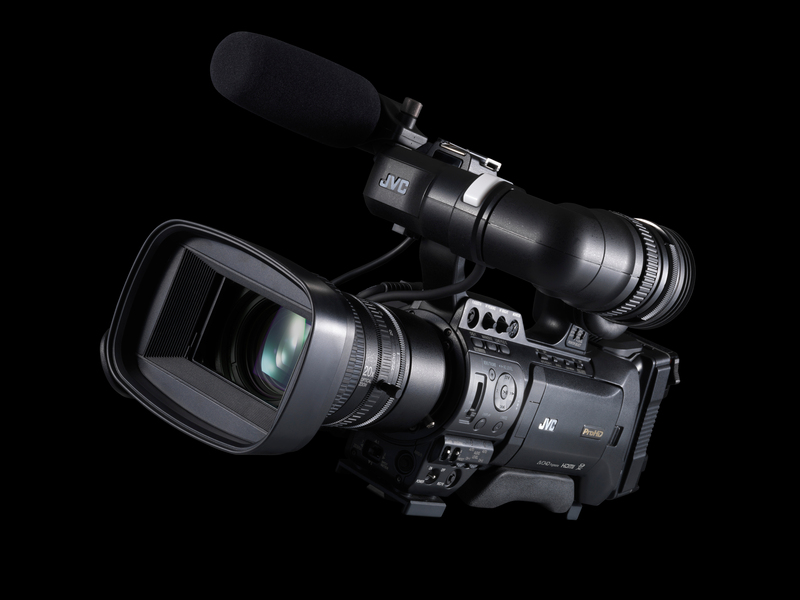 Beyond ENG, the GY-HM890 is a versatile studio or multi-camera field production camera, with a 68-pin connection that accommodates JVC fiber or multi-core camera modules. Compatible with a full range of components, including customized studio sled, zoom and focus controls, CCUs, and 8.4-inch LCD viewfinder, as well as box-style lenses from Canon and Fujinon, the GY-HM890 is an ideal choice as an HD studio camera. 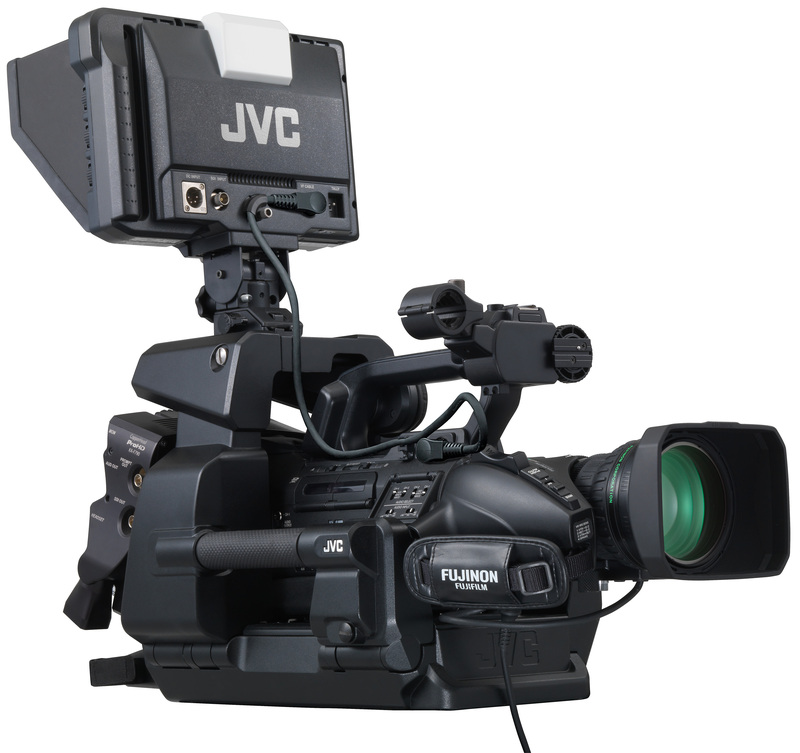 Continuing JVC’s commitment to native file workflows, the GY-HM850 and GY-HM890 record HD or SD footage as Final Cut Pro (.MOV), XDCAM EX (.MP4), AS-10 (.MXF), AVCHD (.MTS), or H.264 (.MOV) files for compatibility with most major NLE systems. Footage can be recorded using MPEG-2 or H.264 compression at a variety of bit rates, frame rates, and resolutions. The dual codecs offer simultaneous recording of a full HD file on one memory card and smaller, Web friendly H.264 files on the other. Plus, a new H.264 Extreme High Quality (XHQ) recording mode, commonly used in HD SLRs, offers virtually lossless H.264 50 Mbps recording. The GY-HM890 also includes an HD/SD-SDI Pool Feed input that can record and stream video and audio from another camera or SDI source during press conferences or other pool feed environments. The cameras also support LANC remote controllers as well as JVC’s proprietary wired remote control system. Including lens, the GY-HM850 has a suggested list price of $7,995, while the GY-HM890 has a suggested list price of $9,995. Both models will be available in March. Headquartered in Wayne, New Jersey, with West Coast operations in Long Beach, California, JVC Professional Products Company is a division of JVC Americas Corp., a wholly-owned subsidiary of JVC Kenwood Corporation. JVC is a leading manufacturer and distributor of broadcast and professional video and audio equipment, D-ILA front projection systems, and Super LoLux HD video security products. For further product information, visit JVC’s Web site at http://pro.jvc.com or call (800) 582-5825.